An NES controller coffee table is all well and good, but we'd rather have something softer in our living room, wouldn't you? 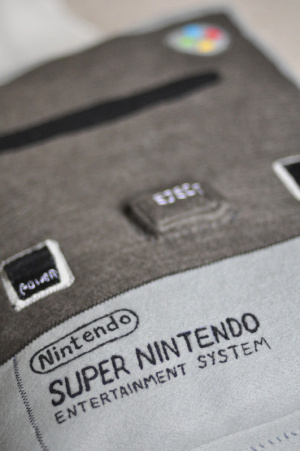 Online store Felt Sew Good just opened up and sells a range of cute cushions based on retro gaming consoles and controllers. NES, SNES, Game Boy and more are all represented in adorable form; there's even a Speak & Spell cushion in case you grew up with non-Nintendo hardware. Hey, you never know. The gaming cushions are available to buy now, with more designs — like a Game Boy Color — due in the future. Update: Get 10% off with the code FSGTEN. I didn't see the Pit Plushie. If I could find it i might look into it. @Marakuto Your avatar fits your comment so perfectly that I not only laughed out loud but subsequently felt like a horrible person for doing so. Um. Why exactly would you want a plush Gameboy? I'd sooner load up the cost of all that feltage into my 3DS and go a on a virtual bender. I saw that the prices are in pounds. Do they not sell to NA? I would rather get a game then the cushion. OH MY GOD! THESE ARE AMAZING! I'M GONNA BUY THIS RIGHT AWAY!!!! And they look cool... but I won't be getting any. My dog would rip those apart! @ATDI are you going to buy one? I like gameboy the best. agree with ATDI, these prices aren't that bad, you guys are just cheap. These things are obviously hand made to order and a lot larger than I expected. unfortunate that the site has bad pictures of some of them. Why only close ups of some things that you're going to spend some money on? I may get one of the Super Nintendo ones, I wish they had the purple NA version. Gameboy one is awesome, too. I agree, I wish they had bigger/clearer pictures. If they had the NA SNES controller I would have already bought one for my game room. The price isn't terrible, the lack of pictures is. You can have 10% off if you enter the code FSGTEN at the check out. Love it. SO tempted to order them! I want a GameCube stool to sit on. With handle.